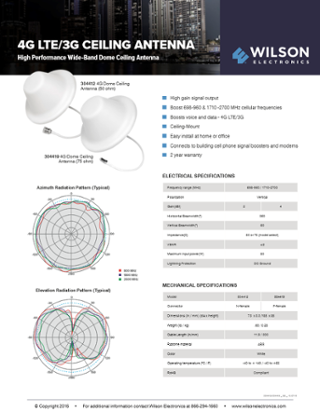 The WilsonPro 4G Dome Ceiling Antenna for indoor residential installation (SKU 304419) provides wide band coverage for 4GLTE /3G cell phone signal boosters on the 698-960/1710-2700 MHz frequency bands. Omnidirectional signal pattern receives and transmits 360 degrees and provides up to 5.1 dB gain. Low profile white dome fits with virtually any decor. 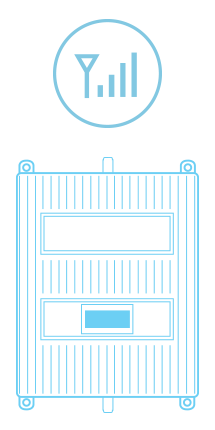 Works with 75 Ohm devices on all U.S. and Canada cell carriers. Features built in ground plane and includes mounting hardware. F-Female connector. Dimensions 7.3 inches diameter (185 mm) by 3.3 inches high (85 mm).